Western Canada Theatre would very much like to thank RBC Emerging Artists Project and those from RBC associated with it for their donation of $10,000 to WCT. 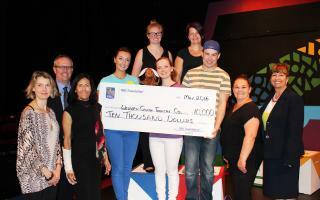 Dave Maurer, RBC Branch Manager Kamloops Main and Chase, and Pam Shaw, RBC Regional Vice President, presented the cheque to Lori Marchand, General Manager of WCT, on the set of the WCT/TRU Young Company’s production of The Velveteen Rabbit. The RBC Emerging Artists Project helps artists bridge the gap from emerging to established and supports organizations that provide the best opportunity to advance their career trajectory. It supports arts organizations and artists in a range of genres including visual art, music, theatre, performance, literature and film. Bridging the gap from emerging to established is something in which WCT has great experience. The theatre company has a long history of supporting and encouraging emerging artists. We believe it is a long-term investment that begins with exposure through our school matinee program, continues through our Stage One Theatre School and manifests itself in professional opportunities, such as the WCT/TRU Young Company, for those who choose a career in the performing arts, be it in performance, stage management, design, playwriting or directing. The Velveteen Rabbit not only provided those launching their professional careers, but also introduced 900 children from 12 local schools to the wonders and magic of theatre. WCT thanks RBC and the Emerging Artists Project for their generous contribution, which allows us to continue developing talent for now and the future.